Your September dose of AMuslimFund! The one donation to rule them all. AMF's Board of Directors held its second annual retreat in mid-September. We reviewed our progress and efforts so far, and set our priorities for the next three years. More than ever, we are committed to continuing the important work of our community foundation to transform Muslim philanthropy for today and generations to come. From an idea in 2016 to an organization distributing over $500,000 to nearly 100 organizations since July 2017, our growth is reflective of your trust in our ability to be stewards of your donations. Thank you for joining us in this journey. As always, we welcome your feedback and questions. If you'd like to volunteer your skillset, reach out to learn more about how you can help accomplish our goals in 2018 and beyond! Co-Founder, Muhi Khwaja will be visiting Seattle, WA October 7-8, Houston, TX October 19-21, and New York City, NY from November 2-7. If you or your family and friends would like to meet and find our more about how we can help with your charitable-giving, get in touch! We will be hosting some events and we would love it if you could join us. If you're interested in hosting AMF in your home or place of worship, let us know, we would love to visit. As with any growing organization, we are looking to increase our monthly donations. Whether it's $5, $50, or $500 a month, please consider investing in a community foundation that works for you. Each gift we make showcases the philanthropic spirit of the Muslim community. 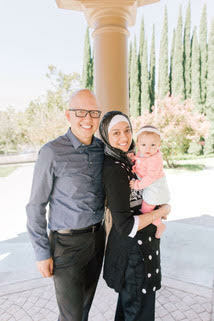 With the Muslim population of the U.S. being 1%, we'd love to showcase Muslim philanthropy in the U.S. as being greater than 1% of charitable giving! You can help us showcase the strength of Muslim philanthropy by opening a DAF. Please visit www.AMuslimFund.org/dafs or click the video image below to learn more about DAFs. Fund our strategic initiatives by contributing to our Endowment so we can make a sustainable difference for generations to come. This month we would like to highlight Clubfoot Solutions. Clubfoot Solutions is a non-profit organization that provides Iowa Braces to families in need around the globe. The Iowa Brace was developed at the University of Iowa by Dr. Ignacio Ponseti in the 1940s. He developed a non-invasive technique that utilized gentle manipulation and serial casting of the feet to successfully correct clubfoot without major reconstructive surgery. Today, the Ponseti Method is the international standard for clubfoot treatment with a 97% correction rate. Clubfoot Solutions ensures that children across the world have access to the best clubfoot brace, regardless of their economic or social circumstances. The combination of innovation and humanitarian considerations allow the Iowa Brace to be affordable for all families everywhere. Since inception of Clubfoot Solutions in 2012, over 60,000 Iowa Braces have been provided to families in need around the globe. In a partnership with the Indus Hospital in Karachi, Pakistan, a generous family from the American Muslim Fund sponsored a sustainable clubfoot bracing program for children patients seeking clubfoot treatment providing over 3,000 braces. Throughout the years, we have supported a mix of social justice and humanitarian causes both in the United States and globally. We are compelled to support organizations that have a lasting, broad impact and see AMF doing that by establishing a community foundation. From year to year, we tend to vary our support, however creating a Donor Advised Fund earlier this year allows us to donate in a more effective and simple way. We can continue to donate to the organizations we have in the past all while learning about new causes, and support them on a timeline that works for us. Each gift we put into our family fund has the potential to be invested before being distributed, and that is ideal for our family and creates greater impact. What American Muslim Fund allows us to do, along with all of the charities they support is critical to allowing our community to thrive. Before opening our DAF, we had many questions that AMF took time to explain and answer, such as the tax benefits and how to get organizations approved for funding. We have been very happy with our choice to work with and through AMF for our zakat & other charitable donations. It has really simplified our giving. We ask that you join us in supporting American Muslim Fund today. Send us a Organization Highlight/Donor Spotlight to be featured! 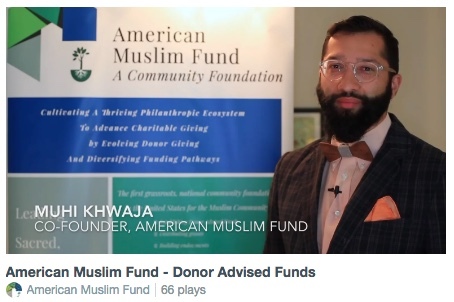 Founded in 2016, the American Muslim Fund (AMuslimFund) is a grassroots, national community foundation in the United States focused on creating Donor Advised Funds, distributing grants, and building endowments for the Muslim community. Leading sacred, sustainable & strategic Muslim philanthropy for today & future generations. 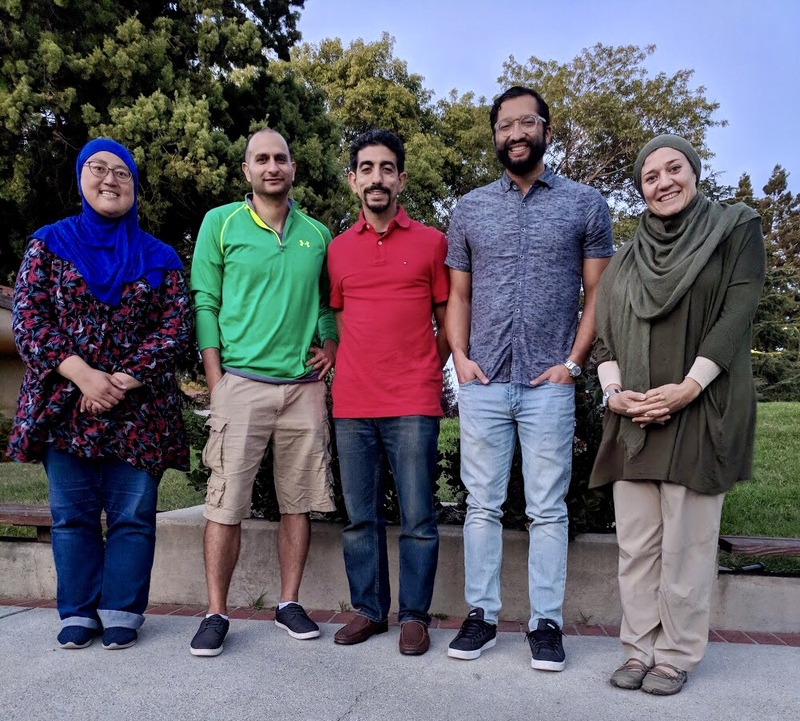 American Muslim Fund cultivates a thriving philanthropic ecosystem to advance charitable causes by evolving donor giving and diversifying funding pathways for community organizations.